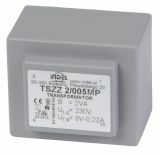 PCB Transformer 24 VAC, 2 VA Low-powered transformer for PCB mount with secondary voltage of the secondary winding 24 VAC and power 2 VA, encapsulated in fireproof plastic box and galvanically separated primary and secondary winding. List Price 6.50лв. VAT Incl. 6.17лв. VAT Incl. PCB Transformer 15+15 VAC, 2x1 VA Low-powered transformer for PCB mount with secondary voltage of the secondary winding 15+15 VAC and power 2x1 VA, encapsulated in fireproof plastic box and galvanically separated primary and secondary winding. 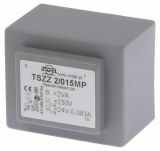 PCB Transformer 12+12 VAC, 2x1 VA Low-powered transformer for PCB mount with secondary voltage of the secondary winding 12+12 VAC and power 2x1 VA, encapsulated in fireproof plastic box and galvanically separated primary and secondary winding. PCB Transformer 12VAC, 2VA Low-powered transformer for PCB mount with secondary voltage of the secondary winding 12 VAC and power 2 VA, encapsulated in fireproof plastic box and galvanically separated primary and secondary winding. PCB Transformer 9+9 VAC, 2x1 VA Low-powered transformer for PCB mount with secondary voltage of the secondary winding 9+9 VAC and power 2x1 VA, encapsulated in fireproof plastic box and galvanically separated primary and secondary winding. PCB Transformer 9 VAC, 2 VA Low-powered transformer for PCB mount with secondary voltage of the secondary winding 9 VAC and power 2 VA, encapsulated in fireproof plastic box and galvanically separated primary and secondary winding. PCB Transformer 7.5+7.5 VAC, 2x0.3 VA Low-powered transformer for PCB mount with secondary voltage of the secondary winding 7.5+7.5 VAC and power 2x0.3 VA, encapsulated in fireproof plastic box and galvanically separated primary and secondary winding. Transformer for printed installation 12+12 VAC, 2x0.3 VA Low-powered transformer for PCB mount with secondary voltage of the secondary winding 12+12 VAC and power 2x0.3 VA, encapsulated in fireproof plastic box and galvanically separated primary and secondary winding. 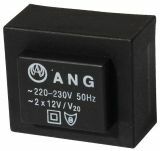 PCB Transformer 9+9 VAC, 2x0.3 VA Low-powered transformer for PCB mount with secondary voltage of the secondary winding 9+9 VAC and power 2x0.3 VA, encapsulated in fireproof plastic box and galvanically separated primary and secondary winding. Price 3.64лв. VAT Incl. 3.46лв. VAT Incl. 3.28лв. VAT Incl. List Price: 5.20лв. VAT Incl. Price 3.85лв. VAT Incl. 3.65лв. VAT Incl. 3.47лв. VAT Incl. 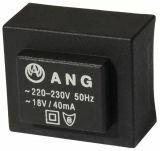 In our store, you will find a variety of transformers for PCB mounting, with one or more secondary voltages, designed for use in electronics. Their mode of connection is via pins to the PCB. All technical parameters such as secondary voltage and power are indicated in the description of each of the transformers in this category. VIKIWAT wishes you a pleasant shopping!